The !Ae!Hai Kalahari Heritage Park, the ancestral home of the ǂKhomani San and Mier communities, has just been declared an International Dark Sky Sanctuary, recognizing its value as one of the world’s darkest places and best areas for viewing pristine night skies. Awarded this designation by the International Dark-Sky Association (IDA), the park – part of the 38,000-sq km Kgalagadi Transfrontier Park straddling South Africa and Botswana – becomes one of only a few International Dark Sky Sanctuaries in the world, and joins NamibRand, a Dark Sky Reserve, as the only other IDA-accredited Dark Sky Place in Africa. The application was championed by !Xaus Lodge, the only place with permanent lighting in the !Ae!Hai Kalahari Heritage Park. Night really falls there, nearly totally free from pollution, including light pollution, natural atmospheric pollution, and man-made pollution. On the SQM (or Sky Quality Meter, pronounced ‘squim’) scale of darkness, with 22 being as unadulteratedly dark as you can get, !Xaus Lodge and environs measure an average of 21.6. 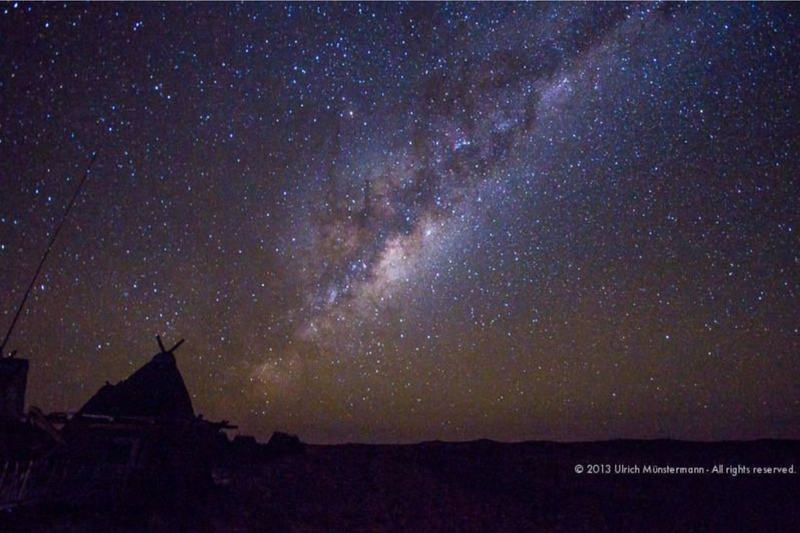 “Astro-tourism, has been identified as a particular growth area within the Northern Cape Province, South Africa where the geography, climate, and existence of limited infrastructure provide an ideal environment for astronomy,” said Terance Fife, Chairman of the Joint Management Board of the !Ae!Hai Kalahari Heritage Park. “Seen in the context of an existing astro-tourism industry around the SALT observatory in Sutherland, and the projected growth in astro-tourism as a result of the development of the SKA around Carnarvon, the Northern Cape Province is already the country’s premier astro-tourism destination. The !Ae!Hai Kalahari Heritage Park – created in 2002 through a land claim awarded the ǂKhomani San and Mier peoples – comprises 50,000 hectares of remote, unspoiled, semi-desert savannah, much of which is ancestral land, of particular significance to the ǂKhomani San. As the only lodge in the Heritage Park – and co-owned by the ǂKhomani San and Mier communities — !Xaus Lodge has long prioritized protecting the almost light pollution-free night skies, and offers stargazing to its guests, through telescopes and the naked eye. Since its application for Dark Sky certification, !Xaus Lodge has retrofitted all outside lights so they are shielded and lighting is kept below the horizontal. Lights at the lodge remain minimal, and electricity is restricted. The sky is spiritually and culturally significant to the ǂKhomani San, one of the world’s oldest ‘First People’, whose culture is full of skylore: tales of the sun, moon, stars, galaxies. Maintaining Dark Skies is a cultural imperative for the ǂKhomani San, as part of their efforts to preserve their traditions and to teach and transfer them to the younger generations. Maintaining pristine Dark Skies also benefits the local flora and fauna – in spite of first glances suggesting barrenness, the area is full of life. Life specifically adapted to the arid environment and its relentless heat. Animals there turn nocturnal to avoid the day’s worst heat; plants adapt to avoid water loss to the sun; birds and insects also adapt. Sustainable conservation management of the area requires that the natural dark skies there remain undisturbed or disturbed as little as possible. Having earned this designation as an International Dark Sky Sanctuary, the !Ae!Hai Kalahari Heritage Park will hopefully serve as a model and inspiration for other sites in southern Africa and around the world whose night skies deserve to be preserved.